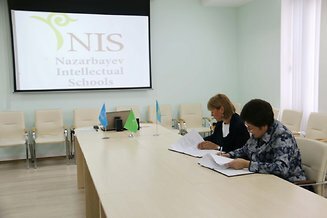 A Memorandum of Cooperation between Nazarbayev Intellectual Schools AEO and UNESCO was signed on 11 September 2017 in Astana. In April 2017, the Director of UNESCO Almaty Office, Krista Pikkat, visited Nazarbayev Intellectual School of Physics and Mathematics in Astana, and got acquainted with the system of Intellectual schools. Priority directions of educational and humanitarian cooperation were discussed. At the signing of the Memorandum, Krista Pikkat noted that special attention is paid to joint actions within the framework of the 4th sustainable development goal - "Quality Education". "Modern education is changing at a rapid pace. It becomes important to learn not knowledge, but skills, the ability to analyze, be flexible and conduct intercultural dialogue. Our organization has extensive experience in education on global citizenship and sustainable development. Experts are drawn to jointly seek solutions and localize them in Central Asia. We are pleased that now our partners in Kazakhstan are Nazarbayev Intellectual Schools, "- stated Krista Pikkat. "Cooperation with UNESCO is important for us. The organization's experience in evaluation matters is of special interest, because no program will be effective without a properly constructed assessment system, including the assessment of complex skills. In connection with the changing world and the flow of migration, the issue of tolerance upbringing and education in the spirit of global citizenship is becoming topical. We are ready to work on joint projects," - summarized Kulyash Shamshidinova.